Muster 8 is Virtual Vertex next generation render farm management system for film production, game development, and visual effect industry.Built on the top of state-of-the-art technologies coming from ten years of developing and stress testing all around the world, Muster 8 maximizes your render farm and let you delegate the resources monitoring to a complete automated environment. 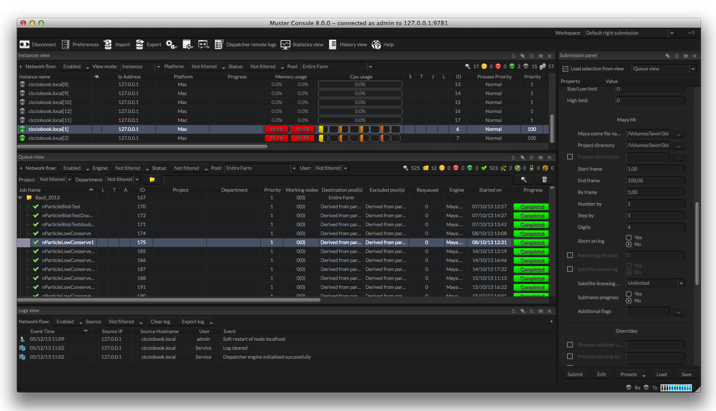 Realtime visual feedback and configuration GUI supporting oneclick propagations of configurations (Muster console) and full featured command line tool (Mrtool). Linux 64 BIT Kernel 2.6.35 running GLIBC 2.13 or greater. CentOS 7 x64 and Fedora 14 x64 are our compiling and testing platforms.